Not as tall as I expected, but will be very visible from Central Park. There are still at least 3 other sites along W 57th that should result in large towers as well. Though Cetra Ruddy could be the architects of record, I think they probably are the design architects. Like 1 Madison Park, this will be a very narrow tower; it'll only have 27 units, and less than 100,000 SF of zoned sqft..
there were some construction materials piled up behind the fence, but excavation has not yet begun. Is there a final design? I thought that the greenish glass design was from around 2008 and might not be what will be built. The zoning diagram for this project is up and available for viewing on the DOB site. It looks very promising. "What's Going On Here?" must be a rhetorical question since that sign doesn't answer it. Usually below the sentence "New York City has a variety of crap being built" there is supposed to be a site-specific phrase such as "Here a 20-story piece of dung is being slapped together for a motel." Forget Park Avenue, forget Central Park West, forget Bond Street. Pretty soon, 57th Street is going to be the place to live in New York. Already we have the uber-hyped One57, where billionaires buy condos pushing $100 million. The taller-than-1WTC 432 Park is just beginning to rise a few blocks away, with the recent revelations its penthouse will be asking $85 million. And at some point in time, Gary Barnett, the man responsible for One57, will begin work on another luxury tower on the corner of Broadway and 57th Street. As if that were not enough, here comes a 51-story bolt of luxury to the heart of Manhattan. Back in May, Starwood Capital announced it had sold a majority stake to JDS Development for a site it had long controlled at 107 West 57th Street—on the same block as One57. According to a March building permit on file with the city, the tower will reach 697 feet, about two-thirds the size of One57 but 140-feet taller than the landmark Essex House on Central Park South. The project is designed by Cetra/Ruddy architects, who may be best known for another slender condo tower, the blocky One Madison, which overlooks the park of the same name. Renderings of the firm’s 57th Street project have been making the rounds among developers and brokers in the city, which is how they made their way into our rendering-loving hands. They show a more angular structure, with swooping, faceted edges not unlike the nearby LVMH headquarters. As the building slopes away from 58th Street, terraces jut from the face—providing full views of the park, of course. 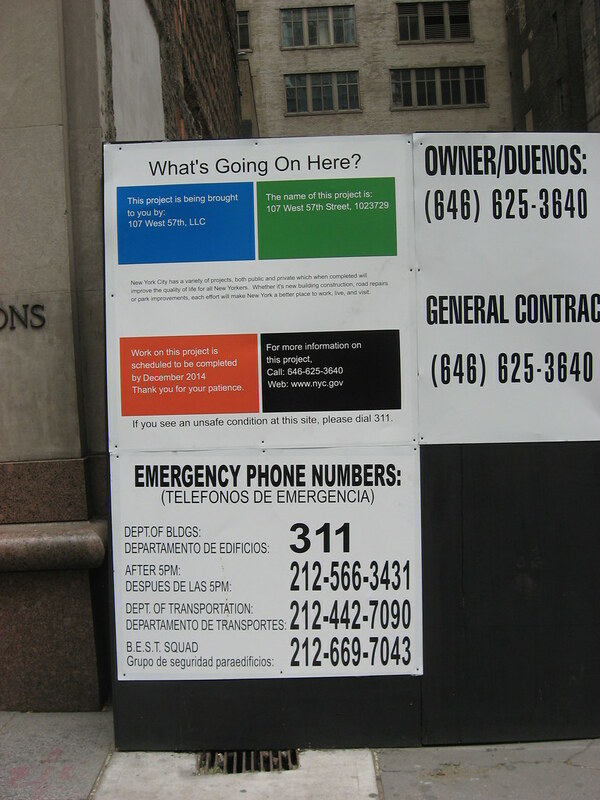 The building site, just off Sixth Avenue. The building is narrow, located on a 43-foot wide lot, about the size of two row houses. This creates for quite the exclusive building, as there is no more than one apartment per floor, according to the building permits. In fact, there are more duplexes (14) than simplexes (13). The latter are located on floors 7 through 19 while floors 20 through 46 contain the former. The top of the building is dedicated to a quadraplex that will no doubt challenge its neighbors on the block for price supremacy. The 51st and final floor is listed as “recreational space.” Forget Top of the Rock. How about Top of the Shard. As for the rest of the building, it contains retail on the first, second and third floors, nearly 10,000-square feet of it. There is also recreational space on the second and sixth floors, where amenities for residents, like lounges, common outdoor space and workout rooms will presumably be located. A spokesman for JDS, which is best known for its work on the Walker Tower in Chelsea, declined to comment. There, too, the firm is creating some striking apartments with commanding views of the surrounding landscape. Perhaps next they can build something crazy down on the Battery. Wouldn’t it be great if they revived Santiago Calatrava’s plans for a stack of Seaport cubes? Certainly would seem to fit the portfolio. What's your opinion about the north-facing protruding balconies? I don't like them. Nonetheless, this project is more ambitious than the lousy box that Barry Sternlicht is building across from MoMA. I don't expect anything perfect. Sadly, the London quest for perfection is inapplicable in Kaufman City. Last edited by londonlawyer; September 26th, 2012 at 06:59 AM. 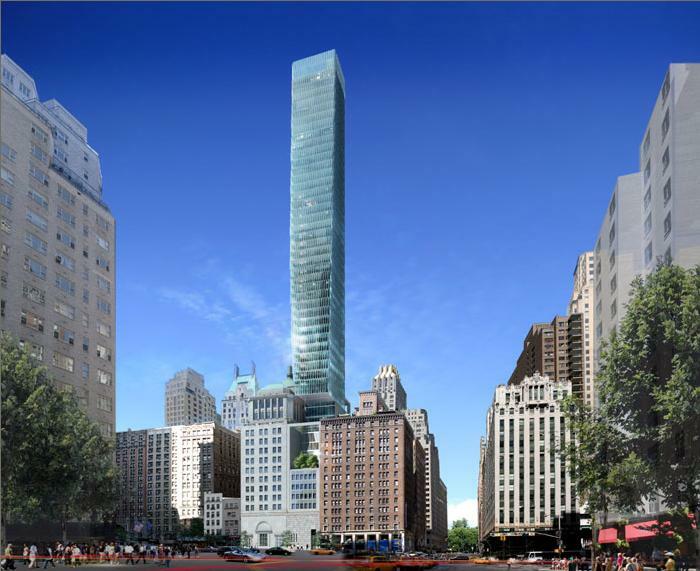 Another tall, skinny residential tower to pierce the sky in Midtown Manhattan. The currently empty lot at 107 West 57th Street will soon be home to one of the city’s narrowest tall buildings. Slated for completion in 2014, a mixed-use tower will rise 688 feet in the air from the modest 43-foot-wide by 100-foot-deep site. Developed by JDS Development Group and designed by local architecture firm Cetra Ruddy, the 51-story residential high rise with retail on the first four floors will fit into Midtown’s zoning envelope, its south face stepping and tapering back from the street as it ascends. The firm also designed One Madison Park, the slim tower of stacked cubes on 23rd Street. building sway and provide a stable environment for residents. Sliver City. Up high, where the 0.001% lives. I am liking this trend.